When was the last time you had dinner for two, including prime rib and a bottle of wine, with the tab coming to just $30? Certainly not in this decade. But let’s back up a bit. 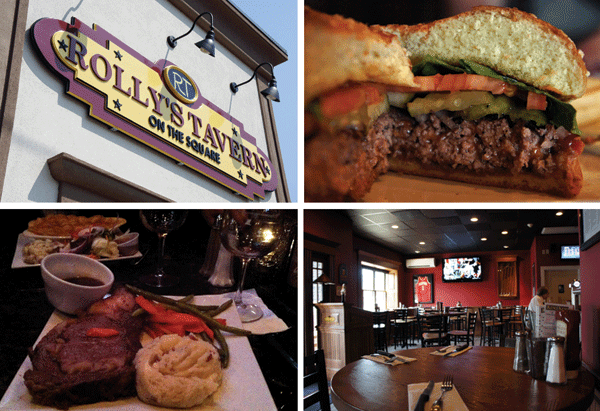 We lunch with Corey Jackson, charming champion of the Lynn arts scene and Managing Director of Arts After Hours, on a semi-regular basis, and a few weeks ago he suggested Rolly’s Tavern in Wyoma Square. The restaurant, helmed by Chef Rolly Hayes and his wife, Wendy Meninno Hayes, opened in 2005 and recently underwent a major renovation. In fact, the project continues as they enlarge through the rear of the space. The place is casual and welcoming with a large bar graced with plenty of TVs for sports enthusiasts. At lunch, Corey opted for the famous grilled ham and cheese sandwich, which Boston Globe Magazine listed as one of Boston’s 45 Best Sandwiches. This childhood fave, served on white or wheat with a side of fries, was savory and satisfying. I chose the Rolly’s burger, a half-pound of Black Angus grilled to order, served with a side of fries ($9). Talk about a seriously good burger—juicy on the inside with a nice char outside and plenty of toppings. I would have gone back for the burger alone, but what caught my attention were the weekly specials. Monday features a two-for-one special on the burgers, and Tuesday and Wednesday host the aforementioned dinner deal: two entrees and a bottle of wine for $30. The specials list includes a variety of entrées, some of which are higher end and add $4 or $5 to the overall price. Rolly’s posts the menus for that evening on their Facebook page. We returned on Tuesday night, when the menu included a prime rib au jus, and we opted for the queen cut at $16 (the king cut is $19). Although the butternut squash ravioli in a whiskey cream sauce was tempting, we opted to try the chicken pot pie at $14. Both entrees were hearty comfort food, perfect for a chilly evening. The prime rib was tender and flavorful, and the vegetable sides were a step above standard pub fare. The mashed red bliss potatoes had great texture, rich but not overly creamy, and the steamed green beans and carrots had a nice crunch to them. The all-white-meat pot pie offered an appetizing roasted chicken flavor, was topped with a lovely flaky puff pastry, and was accompanied by a fresh garden salad. The wine included in the deal is Salmon Creek, which is available in chardonnay, white zin, pinot grigio, merlot, or cabernet. Also available for a $3 add are the wines from Lynn’s own Urban Wine Project. Whether you’re looking for an inexpensive date night or just want to relax after work while someone else does the cooking, we think you’re going to be hard pressed to find a better deal than Rolly’s midweek specials.